Is the indyref betting market being skewed by English money? The odds for a YES vote moved in again today, to 7/2 from 4/1. That’s a fairly significant shift since the second debate, when the odds were 9/2. I’ve seen an argument recently that the betting markets don’t really reflect opinion in Scotland, because large staking English punters are backing NO and skewing the odds. Let’s have a look at all of the money Ladbrokes have taken on the outright result since the debate finished on Monday night, broken down by country. 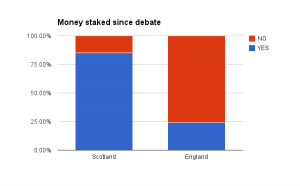 So, even though most bets from England are for YES, a few bigger bets mean that the actual total stakes are more in favour of NO. Based on all of the bets we have taken this week, there is certainly some evidence to back up the claim that a small number of wealthier, English punters are keeping the YES odds at a higher level than they would otherwise be. Does that mean the betting markets are “wrong” and underestimating the true chance of a vote for Independence and missing the real “feeling on the ground”? Maybe, but it’s also perfectly plausible that people who have less emotional capital invested in the result are forming a more objective opinion on the likely outcome. If this is on a knife edge, why is YES 7/2?